This chapter presents recursive least-squares (RLS) algorithms, which are based on numerically robust Householder transformations. Section 7.1 introduces the conventional orthogonal Householder transform and provides its geometrical interpretation. The hyperbolic Householder and the row (orthogonal and hyperbolic) Householder transforms are also briefly described. In Section 7.2, the Householder RLS (HRLS) algorithm is presented, its relation with the other known square-root RLS algorithms is discussed, and two applications, where the HRLS algorithm has been successfully applied, are presented. By considering a block-by-block update approach to the RLS problem, the block exact Householder QRD-RLS algorithm is developed in Section 7.3, which constitutes a generalization of the conventional QRD-RLS algorithm. 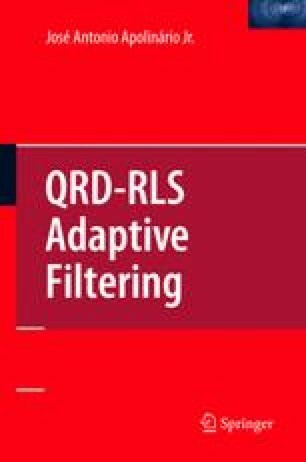 Section 7.4 presents an inverse QRD-RLS algorithm, which employs block updating via the application of appropriate row orthogonal Householder transformations. Finally, a sliding window block RLS algorithm, which comprises a pair of row Householder transforms, is introduced in Section 7.5.